There are always clear signs of excess at market tops -- which everyone typically sees in hindsight. With stock market averages trading near all-time highs and now two companies' market caps topping $1 trillion, it's time to considering some boring, financially strong dividend payers. Here are three stocks to get you going: NextEra Energy, Inc. (NYSE:NEE), The Hormel Foods Company (NYSE:HRL), and Magellan Midstream Partners, L.P. (NYSE:MMP). NextEra Energy is really two businesses in one. The first, Florida Power & Light, is a regulated electric utility operating in, as you might have guessed, Florida. The second, NextEra Energy Resources, is a renewable power merchant business that happens to be among the largest wind and solar power producers in the world. NextEra has used the stability of the regulated business to build a huge contract-based renewable power business, and boasts a current yield around 2.6%. Both sides are growing. NextEra recently bought a competing Florida utility from Dominion Energy and is continuing ground-up construction on the renewable side, and NextEra plans to spend as much as $25 billion to build new generating capacity between 2017 and 2020. Combined with the $19 billion NextEra plans to spend on the rest of its business, management is projecting earnings growth of 6% to 8% in each of the next four years. Dividend growth, meanwhile, could be as much as 14% as the company allows its payout ratio to increase from currently low levels (43% in 2017). Note that the dividend has been increased annually for 24 consecutive years. 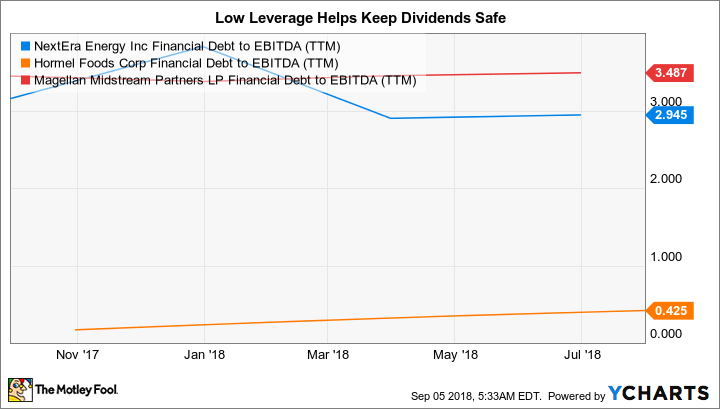 Leverage, meanwhile, is modest, with a debt to EBITDA of just around 3 times. The next company up is Hormel, which is best known for making SPAM but has a much broader portfolio beyond that. In fact, it has leading positions in 35 categories throughout the grocery store. Moreover, it has been shifting its portfolio toward higher margin, in-demand products in recent years, including Wholly Guacamole and Columbus, the latter of which has expanded its reach in the fast-growing deli space. Part of this upgrading process includes selling lower margin and volatile businesses like meat processing plants. A key reason for all of this change is that Hormel is trying to adjust to shifting consumer tastes, which are moving toward fresher and healthier foods. At the same time, it is dealing with notable input price inflation, which has been crimping margins. The combination of these two factors has led concerned investors to push shares down to a point where Homel's yield is around 2% -- toward the high end of its historical range -- suggesting now is a good time to buy. But change is nothing new at Hormel, which has increased its dividend for an incredible 52 consecutive years. You don't get to a record like that without working through some tough times. History suggests it will get through the current issues, too. 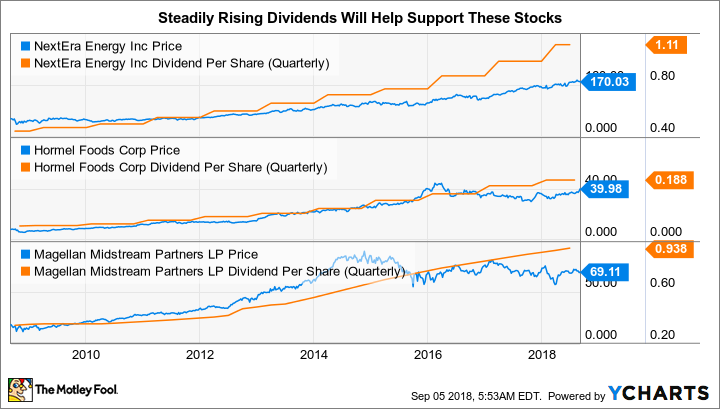 Meanwhile, it will continue to reward patient investors with big dividend hikes, which have been in the mid- to high-teens over the trailing 1-, 3-, 5-, and 10-year periods. Leverage, meanwhile, is incredibly low, with debt to EBITDA at just 0.4 times. Hormel is a rock. The last stock here is Magellan Midstream Partners, a limited partnership that owns the pipes and other assets that help move oil and petroleum products from where it is drilled to where it gets refined and ultimately used. It is, largely, a boring, fee-based business that produces predictable cash flows. Magellan, as a partnership, pays most of that cash out to unitholders, which helps explain its fat 5.5% distribution yield. Magellan is among the most conservative midstream companies around, with debt to EBITDA at just 3.5 times. That's high for this trio of stocks, but at the low end of its industry peers. And it has a long history of putting investors first, most recently deciding to slow distribution growth to the high single digits so it could maintain distribution coverage of at least 1.2 times. Instead of pushing more cash out to unitholders, it is ensuring the strength of the distribution. That's a comforting move with the markets trading near all-time highs. Effectively, it is going to be using more of the cash its fee-based business generates to fund the $2.5 billion in growth projects it has lined up through 2020. Looking at the bigger picture, it's decisions like this that have allowed Magellan to increase its dividend every single quarter since it went public in 2001 (roughly 18 years at this point). With low leverage and a conservative business approach, that streak is likely to keep going even if the markets take a tumble. Animal spirits are running high, pushing stock prices ever higher. That's exactly when you need to be at least a little fearful. I'm not suggesting a wholesale move to cash, but rather a modest shift toward companies with long histories of paying dividends, modest leverage, and decent prospects for continued dividend growth. NextEra, Hormel, and Magellan aren't exciting stocks by any means, but they are ones that will keep rewarding you with dividends even if the market turns notably lower.